The US army and the DoD has certainly recognised the immense threat cyber warfare poses to national security. Increased efforts to defend, counter attack, and even improve “first strike” capability in cyber warfare, are becoming front and center in modernisation efforts. 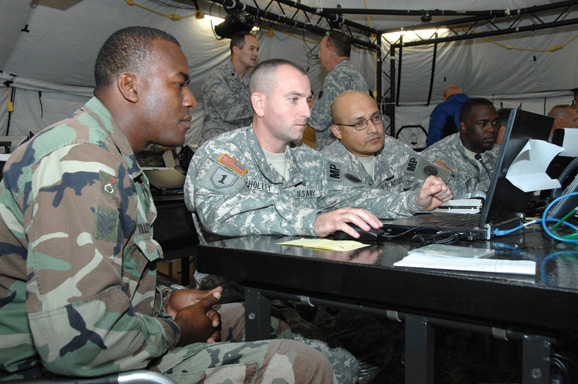 The U.S. Army’s cyber war effort program is known as Integrated Cyber and Electronic Warfare or ICE, and the technology being developed to increase the US government’s ability to be prepared for cyber and electronic warfare is very cool! As we move closer and closer to the ideal of the “networked soldier,” US ground troops are plagued by new and emerging cyber and EW attacks. As with anything involving digital tech, IT and communications, one of the greatest challenges when developing appropriate countermeasures is standardization and integration. Realizing that the Army could no longer take an “old school” approach to the ever increasing threat of EW, the US Army created a new school – literally. The U.S. Military Academy at West Point, N.Y., plans to build a cyber brain trust unprecedented within the service academies, filling 75 positions over the next three years — including scholars in technology, psychology, history and law, among other fields. The goal of the Army’s new academy will be to establish a cyber warfare research institute to groom elite cyber troops and solve the many problems facing the Army and all branches of the military in this new warfighting domain. Though Conti said the interdisciplinary model for the Army Cyber Institute is novel, in developing the program, the NATO Cooperative Cyber Defence Centre of Excellence in Estonia, the Georgia Tech Information Security Center, and the Stanford Center for Internet and Society, all were seen as influential models. Steve Goodman is an award-winning multimedia writer with three decades of experience. Mr. Goodman has written for television programs featuring, cutting edge military technologies that have appeared on PBS, PAX, Discovery, A&E and other national networks. Mr. Goodman is a former First Responder, and a recognized authority on survival, rescue protocols, law enforcement techniques, combat and tactical weaponry and is Editor of SoldierMod magazine.